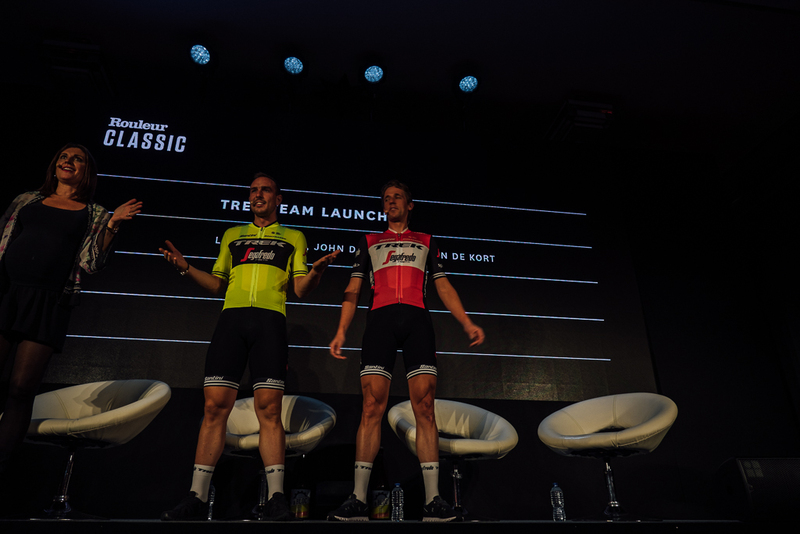 The prestigious London Rouleur Classic provided the venue for today’s unveiling of the new Trek-Segafredo men’s and women’s kits for the upcoming racing season. 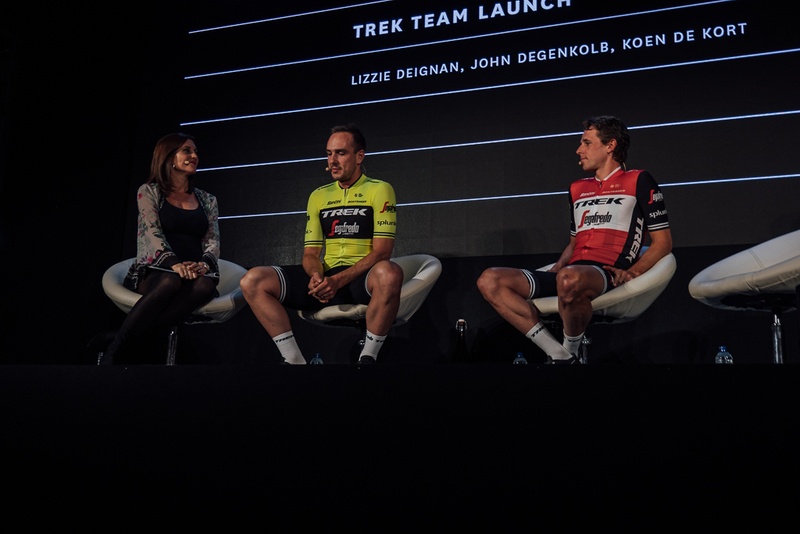 The kits were modelled by team members John Degenkolb, Koen de Kort and Lizzie Deignan. Red and black have been chosen once again for the men’s kit while the women’s will centre around navy blue coordinated with various other lighter blues. The Rouleur Classic has gone from strength to strength over the years because of its position on the calendar and easy-to-get-to venue. 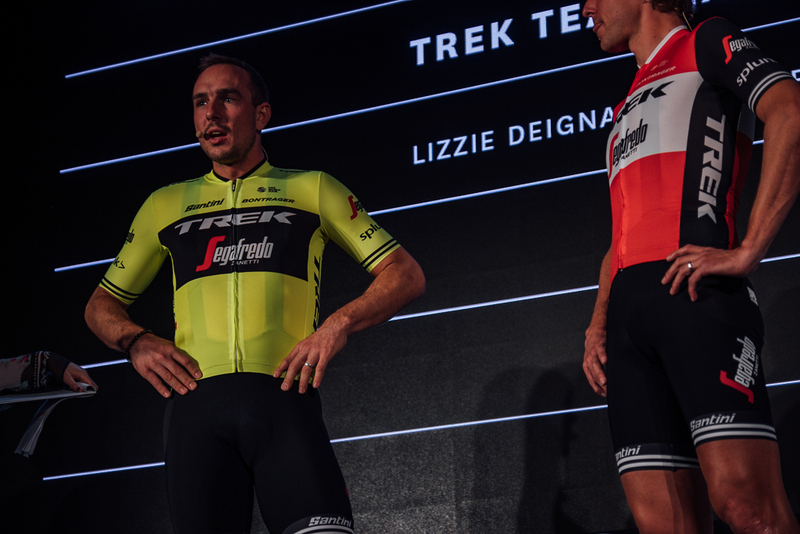 It is now considered the perfect showcase for new season products, so it is hardly surprising that the Trek-Segafredo World Tour men’s and women’s teams chose the London event for the official unveiling of their new kits for 2019. Trek-Segafredo’s technical cycling wear partner, Santini will, of course, be dressing the new women’s team as the men’s squad. The presentation was attended by three Trek-Segafredo team members, German rider John Degenkolb and Dutchman Koen de Kort from the men’s squad, and British cyclist Lizzie Deignan from the women’s, all of whom were modelling the new Santini-designed and manufactured kits. «Dressing the teams and supporting the athletes both in training and in competition, listening to their needs and then creating technical kit designed around those needs has always been a priority for Santini – commented Monica Santini, CEO Santini Cycling Wear – and we are proud that our partnership with the Trek-Segafredo team has now also been extended to supplying the kit for the new women’s squad». Both men’s and women’s teams will be supplied with all the kit they need to tackle a year of both international races at the very highest level and an extremely intensive training schedule. The cyclists will all be receiving full kits and accessories for all the seasons and latitudes they will encounter. Santini paid particular attention to the technical materials used for the winter kits: the teams will receive a broad range of garments made using innovative fabrics and technologies to allow them train and compete efficiently and comfortably in even the chilliest of weather. The Trek-Segafredo kits encapsulate the Italian company’s unparalleled expertise in both design and manufacture in the professional cycling wear sector. John Degenkolb said: «You just got to love our new kits, I wouldn’t be able to choose between them. The retro style is truly amazing. They make me long for the new season to start. 2019, bring it on!». 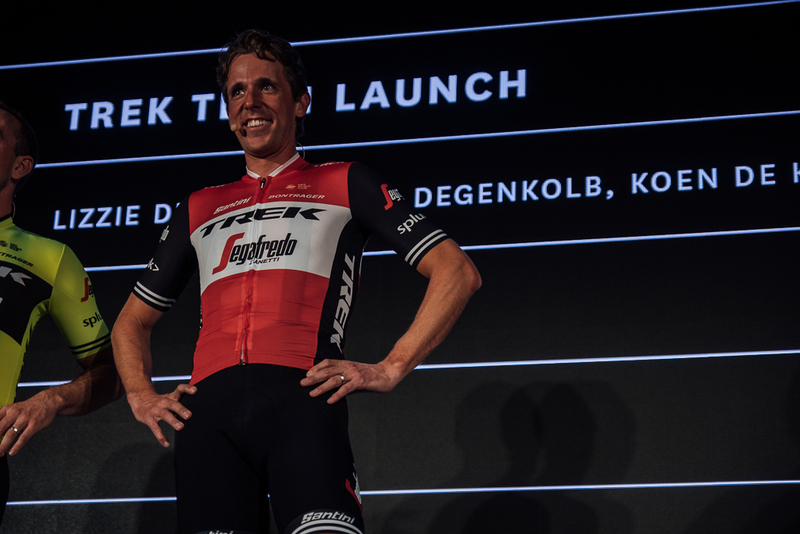 His Dutch team-mate Koen de Kort was equally enthusiastic about the new Trek-Segafredo kits: «I really like the new red race kit. The black bib-shorts are very stylish and I personally love the sleeves of the kit. I think it will stand out in the peloton and we might take best looking kit (again) this year!». 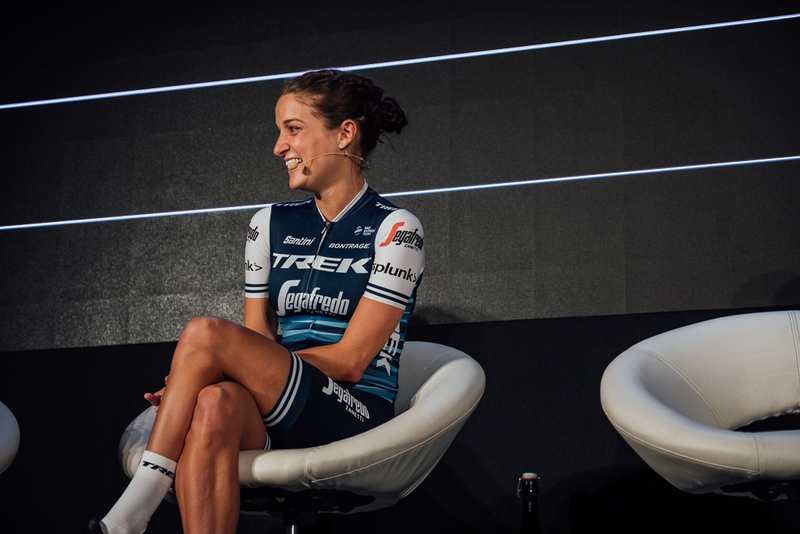 British cyclist Lizzie Deignan said: «I’m really excited about the new Trek-Segafredo kit from Santini and can’t wait to start wearing it for training and racing. Trek and Santini have done a great job designing something that is both functional and stylish. The team are excited about wearing it because it looks good and it is technically second to none so it will be brilliant for performance too». The main kit that the men’s team will be using in competition focuses on the iconic Trek-Segafredo colours of black and red. However, in light of the need to boost cyclist safety during training, the training kits will be made from fluorescent yellow to make the wearers more visible to other road users. Fluorescent yellow will also be used for the women’s team’s training kits. The aerodynamically-cut jersey is made mostly from ultralight yet ultra-tough Bodyfit fabric with perforated Rudy fabric used for the front, pockets, collar and sides to boost breathability. The coordinating shorts have a large area made from Impact, a Sitip fabric incorporating Dyneema® fibres which are 15 times stronger than steel for outstanding abrasion and tear resistance. The fabric, which was also used in the 2018 kit, is particularly popular with the team members who asked for it to be used again in 2019. Impact fabric was also chosen in the development of the road skinsuit that will be provided to all the team too. Colour-wise, the women’s team kit is in a mix of navy blue and lighter blues. Made from the same fabrics as the men’s version, it is specifically cut and tailored for the female body. The navy blue shorts incorporate the innovative C3 Woman chamois which is light and comfortable with guaranteed shock absorption. All the Santini cycling wear supplied to the Trek-Segafredo is made entirely in Italy by the company’s expert staff and using quality materials sourced primarily in Italy. Trek-Segafredo replica team kits will be available online from the Santini site (www.santinisms.it) as well as in all Trek stores and selected cycling retailers worldwide.